MOUNTAIN VIEW, CA – March 25, 2014 – Today eHealth, Inc. (NASDAQ: EHTH – www.ehealth.com), which operates eHealthInsurance.com, the nation’s first and largest private online health insurance exchange, released an update to its eHealth Price Index, including data on key off-exchange enrollment demographics, consumer plan selections, and average health insurance costs for the second half of the Affordable Care Act’s nationwide open enrollment period to date. The open enrollment period began October 1, 2013 and is scheduled to continue through March 31, 2014. The company’s data show that eHealth shoppers since January 1, 2014 tend to be younger and more likely to have been previously uninsured compared to eHealth shoppers in the first half of the open enrollment period. Additionally, eHealth reports that catastrophic plans are growing in popularity since the beginning of the year and that average monthly premiums for plans chosen by shoppers at eHealth have declined at both the national level and in select states surveyed by eHealth, including California, Illinois, and Florida. Between October 1 and December 31, 2013, shoppers between the ages of 18 and 34 years old accounted for 39% of persons selecting off-exchange plans through eHealth. Between January 1 and March 23, 2014, shoppers between the ages of 18 and 34 years old accounted for 45% of persons selecting off-exchange plans through eHealth . In a separate study, eHealth asked shoppers about their insurance status prior to visiting eHealth. Based on the responses, the company reports that a higher percentage of shoppers in the second half of the open enrollment period were previously uninsured when compared with shoppers in the first half of the open enrollment period. Between October 1 and December 31, 2013, one-third (34%) of eHealth shoppers participating in the poll identified themselves as uninsured. Between January 1 and March 23, 2014, half (51%) of eHealth shoppers who participated in the poll identified themselves as uninsured. Between October 1 and December 31, 2013, bronze plans were the most popular, accounting for 42% of all plans selected by shoppers. Catastrophic plans accounted for 10% of all plans selected. Between January 1, and March 23, 2014, bronze plans were still the most popular choice (43% of all plans selected), but the popularity of catastrophic plans increased to 14% of all plans selected. Since the beginning of the second half of the nationwide open enrollment period, eHealth’s Price Index data illustrates a movement towards younger applicants and towards shoppers selecting plans with lower monthly premiums. On January 1, 2014, the average premium for individual plans selected by eHealth shoppers was $290 per month (compared to $197 per month in February 2013), and the average age of individual applicants was 39. By March 23, 2014, the average premium for individual plans selected by eHealth shoppers was $261 per month (a decrease of 10% since January 1) and the average age of individual applicants was 36. On January 1, 2014, the average premium for family plans selected by eHealth shoppers was $701 per month (compared to $426 per month in February 2013), with an average of three persons per family group. By March 23, 2014, the average premium for family plans selected by eHealth shoppers was $654 per month (a 7% decrease since January 1), with an average of three persons per family group. As they have at the national level, average monthly premiums for individual plans selected by eHealth customers in select states surveyed have also decreased in the first quarter of 2014 to date when compared to the fourth quarter of 2013. In the states of California, Illinois, and Florida, eHealth reports the following. Between October 1 and December 31, 2013, the average premium for 2014 individual plans selected by eHealth customers in California was $331 per month. Between January 1 and March 23, 2014, the average premium for individual plans selected by eHealth customers in California was $298 per month- a 10% decrease compared to the October – December 2013 period. Between October 1 and December 31, 2013, the average premium for 2014 individual plans selected by eHealth customers in Illinois was $262 per month. Between January 1 and March 23, 2014, the average premium for individual plans selected by eHealth customers in Illinois was $222 per month- a 15% decrease compared to the October – December 2013 period. Between October 1 and December 31, 2013, the average premium for 2014 individual plans selected by eHealth customers in Florida was $325 per month. Between January 1 and March 23, 2014, the average premium for individual plans selected by eHealth customers in Florida was $271 per month- a 17% decrease compared to the October – December 2013 period. The first-ever nationwide open enrollment period for individual and family health insurance, established by the Affordable Care Act, is due to come to a close after March 31, 2014. This will be the very last date that many American consumers will be able to obtain health insurance for themselves and their families until 2015, unless they experience a qualifying event such as (but not limited to) marriage, divorce, or the loss of employer-based coverage. Consumers without employer-based health coverage (or without Medicare, Medicaid, or another form of minimum essential coverage) who do not purchase health insurance by March 31 may be subject to a tax penalty of $95 per adult and $47.50 per child or 1% of their income (whichever is greater) on their 2014 federal tax return. 1 As reported in the eHealth Price Index Report for October – December 2013. 2 Preliminary Q1 2014 figures based on the same methodology employed for figures reported in the eHealth Price Index Report for October – December 2013. To view the methodology, see the eHealth Price Index Report for October – December 2013. 3 According to an ongoing, voluntary survey of eHealth customers. 4 Figures reported in this section are available through the online eHealth Price Index. 5 According to eHealth’s Cost and Benefits report published in December 2013, based on plans purchased through eHealth and with coverage in effect as of February 2013. This press release contains forward-looking statements, including statements regarding the timing of the end of the open enrollment period for individual and family health insurance and its impact. These forward-looking statements involve certain risks and uncertainties that could cause actual results to differ materially from those indicated in such forward-looking statements, including, but not limited to, the potential changes to the Affordable Care Act and related regulations and rules. Other risks and uncertainties that can affect actual results are included under the captions “Risk Factors” and “Management’s Discussion and Analysis of Financial Condition and Results of Operations” in eHealth’s Annual Report on Form 10-K for the year ended December 31, 2013 and most recent Quarterly Report on Form 10-Q, which are on file with the SEC and are available on the investor relations page of eHealth’s website at http://www.ehealthinsurance.com and on the Securities and Exchange Commission’s website at www.sec.gov. All information provided in this press release is as of the date of this press release, and we undertake no duty to update this information unless required by law. 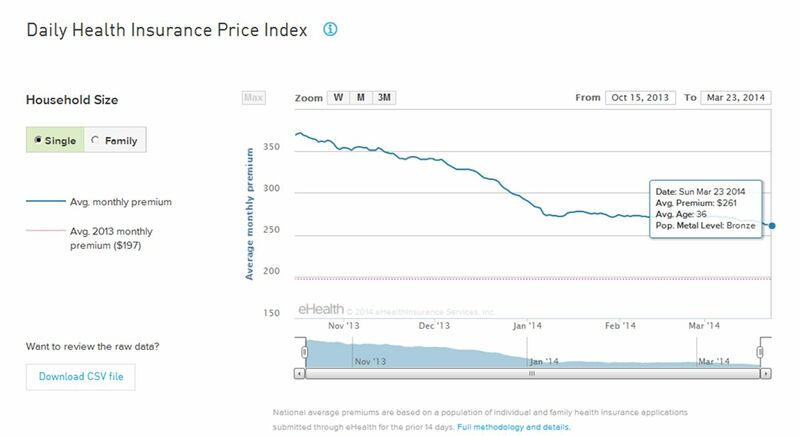 eHealth Health Insurance Price Index as of March 23, 2014.